The monthly survey of workplaces revealed a slower pace of job growth in March, as payrolls grew by 98,000, the lowest gain since last May, and down from the pace in recent months, while downward revisions reduced payroll gains from the first two months in the quarter by 38,000. The survey of households, however, told a more robust story of the March labor market, with unemployment down to a cyclical low of 4.5%, and for the right reasons: job seekers finding work, not giving up and leaving the labor market. That's the lowest unemployment rate since May 2007, while the underemployment rate–a more encompassing measure of labor demand important gauge–fell from 9.2% in February to 8.9% in March, its lowest rate since December 2007. While some news sources will be tempted by this below-trend payroll number to declare a slump in employment growth–"if it bleeds, it leads"–that would be a mistake. One month does not a new trend make. The monthly confidence interval for change in payrolls is 120,000 (meaning that there is a 90 percent chance that the true change in payroll employment for the month of March lies between about -20,000 and 220,000; that's the statistical noise I'm always going on about), the underlying trend remains solid, weather effects may have been in play in March, and the household survey looks strong. It is not unusual for the two surveys released on jobs day to tell somewhat different stories, and the key point to keep in mind re these monthly numbers is that they are noisy. Therefore, we want to be careful not to over-interpret one month's results. Instead, we should look at the underlying trends. Our monthly smoother helps amp up the payroll signal by averaging out some of the noise in the monthly data, taking averages of monthly payroll gains over 3-, 6-, and 12-month spans. Over the past three months, payrolls added 178,000 jobs on average, close to the underlying trend for the past year of 182,000. Given the size and growth of the US labor force, these averages represent a solid pace of job gains that is clearly and steadily moving the job market to full employment. 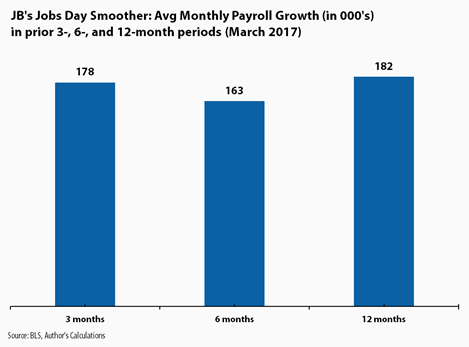 It is, however, a slower pace of monthly payroll gains compared to earlier in the recovery (a year ago, the 12-month average was 229,000). Still, today's lower-than-average (and lower-than-expected) payroll number does not alter my assessment that the job market is closing in on full employment. Of course, if future months show a clear deceleration of the ongoing trend–say, a downshift from close to 200K/month to 100K/month, this would signal a decline in hiring activity and could (I'd argue "should") slow the Federal Reserve's plans to raise rates. Meanwhile, tighter job markets provide wage earners with more bargaining power. 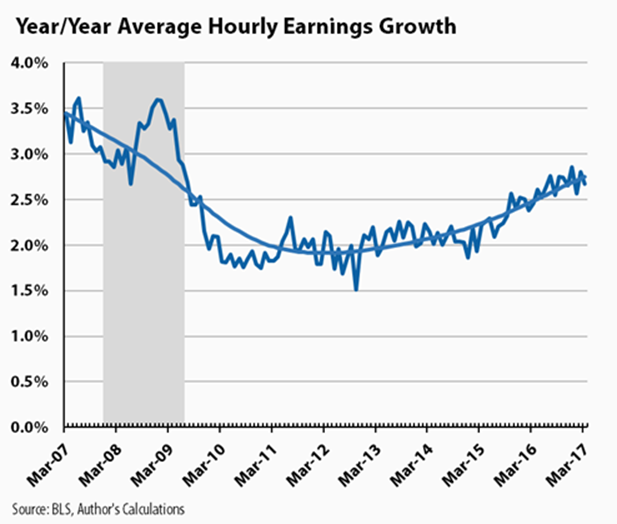 On average, as the next figure shows, average wage growth has accelerated in recent months, from around 2% to a pace north of 2.5% (March came in at 2.7%). A few caveats, however, are notable. First, inflation has also picked up in recent months, partially due to normalizing energy costs, and was growing most recently at about the pace of hourly wage growth, implying flat real hourly earnings. Also, on an annualized quarterly basis, wage growth was 2.4% in 2017q1, below its recent trend. Given data volatility, this doesn't yet imply a slowdown, but we'll track this going forward. –The employment rate for prime-age workers, a closely watched measure to see if the labor market recovery is pulling working-age persons into the job market, was 78.5% last month, up half-a-percentage point over the past year, and another sign of progress. These 25-54 year-old workers have clawed back 3.7 out of 5.5 percentage points, or two-thirds, of their losses since the big downturn. It is thus extremely important to heavily discount reports that such workers are out of the reach of a strong labor market. Some surely are, but many others are clearly not. Be very careful, my friends, not to conflate the cyclical with the structural! –The decline in the underemployment rate reflects the monthly tick down of about 150,000 involuntary part-timers. Over the past year, that measure of slack is down by about half-a-million workers (6.1 million last March to 5.6 million this March). 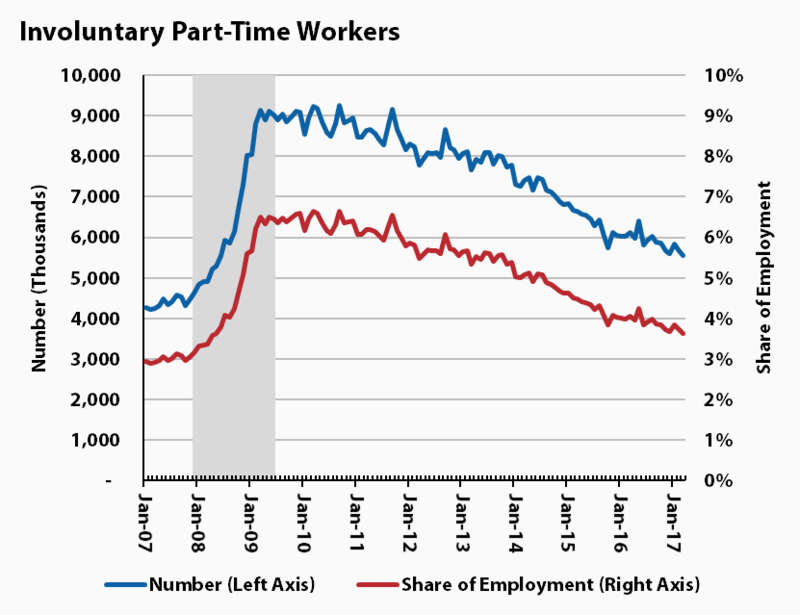 The figure shows a steady, improving trend in the number and employment share of part-timers who'd prefer full-time work, though the series is not quite back to pre-recession levels. –Fans of seasonal adjustment were concerned that the March payroll number would be biased down due to weather effects, specifically unseasonably warm weather that raised February's job gains and, conversely, a winter storm in March that blanketed parts of the Northeast and Midwest during the week in which the job surveys are in the field. But BLS data on absences from work due to weather show a huge spike in full-timers who had to work part-time due to weather (the largest on record for March with data back to the 1970s), but not much of one for people not at work at all. Still, the part-time issue could have dampened March's payroll count, yet another reason not to worry yet about slumping job creation. In sum, moderate, steady GDP growth amidst low productivity continues to equal solid job creation that is squeezing slack out of the labor market. The overall pace of job gains has probably slowed a bit but that is not unusual as we move towards full employment and face utilization constraints. However, there's still room to run on the supply side of the job market, as the prime-age employment rates and involuntary-part-time series reveal. Also, it will be very important for the Fed to carefully track the wage growth point I made above regarding the slower quarterly rate. If that sticks, they'll want to be very careful not to shut down wage gains just as they're catching on.